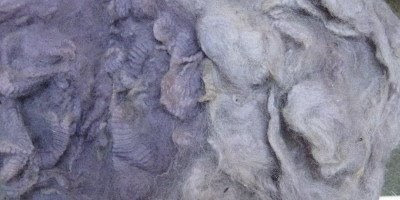 Leigh's Fiber Journal: Natural Dyeing? 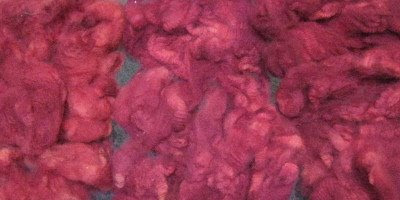 I've dyed some yarns, but usually I like to dye unspun fiber, whether it's with natural or chemical dyes. 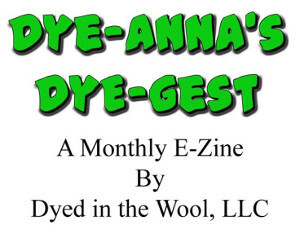 The reason for this is because home dyeing often results in somewhat irregular (splotchy) coloring across the fiber or fabric. Sometimes this is the look one is going for. Other times, an even distribution of color is wanted. By dying the fiber instead of the yarn, I can blend the color as much or as little as I wish (an advantage of spinning my own yarns). Anyway, her question prompted me to pull out my box of natural dye experiments and share them with you. 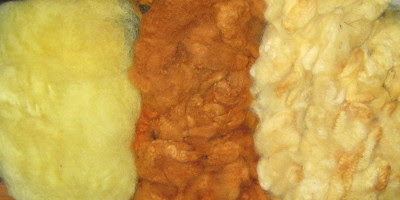 All of them are on raw wool, and all except one are from the same fleece. All were done as part of one of the Online Guild's natural dyeing workshops: "Medieval Dyeing" in May 2003, "Indigo Dyeing" in March 2004, and "Dyeing for Purple" in May 2005. Sadly, all my notes for these experiments were lost when my old computer crashed. I did label the bags, so what I can tell you is taken from that. The information below each photo describes them from left to right. Not labeled! I couldn't believe that I didn't label this. And it frustrates me all over again that I lost so much information in my computer disaster. I really like the color however. So far I've just been a dabbler in the world of natural dyeing. If you want to know more about it, do visit Helen's blog. She is a fellow Online Guild member, and helped tutor some of the workshops. 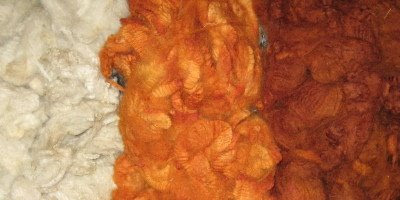 I haven't one any natural dyeing since my son was a pup (30 yrs) but now I seem to be inspired. I am probably just being an alarmist, but those are beautiful photos. If I were you, I would have made copies and splashed words to the effect of copyright by Peg Carpenter right across the middle of each copy and published those photos. You have a very sophisticated graphics program that should allow you to do that. On a more upbeat note, I look forward to following another one of your long spinning/knitting projects. Your last one was so much fun to follow. 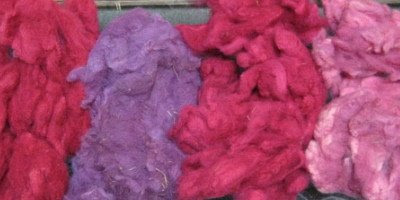 The pictures of your natural dyed fibers so pretty. The most luck I've had with natural dying are black walnut hulls and no mordant. Beautiful shades of brown. 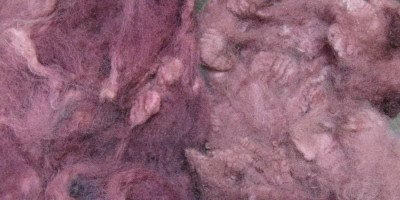 I'm hoping to gather the buds from my prickly pear cacus this fall and dye some fiber or yarn with them. I still need to do some research on what mordants I will need. Thanks for taking the time to show us your pictures. How fun! Thank you for answering my question and taking the time to dig out all your stuff. I love the colors you got I really need to learn more. My favorite is that dark plum. BUGS! The dyeing teacher has a bee in her bonnet about natural dyes this year and with 7 really keen students, the results have been spectacular! I am even getting excited about them. Back in my student days, we did some natural dyes and all that we came up with about 20 shades of yellow and a couple of brown. So 70's and not very exciting. 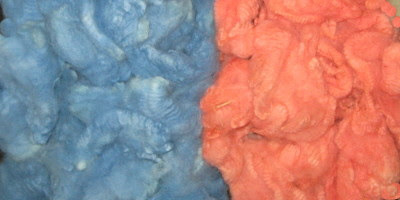 But with the avalibility of different natural dyestuff, the results have become stunning. I also rememebr making our own copper mordant by soaking pennies. Coppper is something that I would normally be warry of, but who is afraid of a few pennies? great job! And thanks for sharing! Jewel and Bspinner, I'm glad to offer the inspiration! Sharon, you're right that some of these things have to be handled with great care. It often strikes me as odd that natural dyeing is potentially more harmful than synthetic dyeing. Seems like it ought to be the other way around! Jackie, sounds like lots of fun. I admit that I'm not one for a lot of yellows and browns either. Yes, pennies is what we used for the copper. And we soaked nails for an afterbath to "sadden" colors. beautiful! Thanks for sharing. 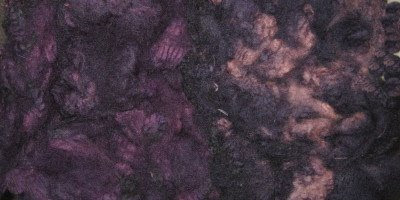 I am always amazed at the colours you can get from natural dyeing! Leigh, what I am talking about is watermarking, though I suspect you are meaning invisible watermarking. With the photos I was talking about, I don't think a small watermark across the center would negatively affect the point you are trying to make vis-a-vis the dyeing. And what you would do is keep the original non-watermarked copy for your personal use. I also agree about the cropping to get around the watermark at the bottom. What I want to try sometime (which I have time......grin!) is to make a nearly transparent watermark so that it is visible but only slightly. Hi Leigh now I know why I suddenly had a lot of traffic from your blog to mine :) The colours are lovely and will look so fabulous together so hope you will spin them. I wonder whether the sample that was unlabelled is a brazilwood/logwood mix? I am aways very upset when I hear people getting so worried about using mordants. I wouldn't use Potassium Dichromate ( chrome ) but the others are okay. I think anyone who wants to do natural dyeing should get a good book, such as Trudy Von Stralens book Indigo Madder and Marigold or either of Jenny Dean's or mine (Colours of the Earth Natural Dye Recipes)and follow instructions and they will be fine. I am writing a long blog about mordants but haven't quite got here yet! Helen, I'm glad to hear that folks are dropping by! I'll be very interested in your mordant blog. Thanks for the book recommendations. I have Jenny Dean's book and really like it.